- Can flush into the toilet. Recommended disposal of wipes: Flush one wipe at a time. - Able to break down after flushing and biodegrade over time. 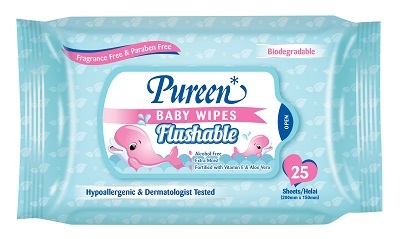 - Flushability is tested in accordance with INDA/EDANA Flushability Guidelines and Code of Practice. - Clinically proven not to induce skin irritation and allergic reaction even for sensitive skin. - Fortified with Vitamin E and Aloe Vera to protect and soothe baby skin. - Gentle on skin and suitable for individual with sensitive skin. Babies: Keep babies fresh and clean. Use at changing time, mealtimes, playtime, at home or on the go. Toodlers: Toilet training and during outdoor activities. Other cleaning purposes: Use as make-up removal, travelling and sports.